Thanks HomeRight for sponsoring this post! We have had a string of mild days in a row, and I am scrambling to take advantage of them before the cold weather comes back! My poor front porch, back porch, and back patio are in sad, embarrassing shape. This summer, we painted the exterior of our home and I wanted a “haint blue” porch ceiling. Some claim that bugs and spiders mistake the blue for the sky and won’t congregate on a blue ceiling. I didn’t really buy this theory in the first place, but I’m here to tell you that our bugs and spiders definitely missed that memo. They LOVE my porch and it was scarier than Halloween out there. This past weekend, I whipped my front porch back into shape with the help of the HomeRight Deck Washer with Telescopic Handle and Deck Washer Soap Dispenser. This thing made cleaning my porch so much easier by combining the tasks of sweeping, scrubbing, and washing all into one step. The first thing I did however, was dry brush the ceiling to remove all of the spider webs. If it were still summer I probably wouldn’t have minded the wet brush but at 60• I wasn’t prepared to get soaking wet! The telescopic brush worked amazingly well at reaching my 10 ft ceilings. I loved that I didn’t have to get a step ladder out to complete the job. After all the creepy crawlies were removed , I began washing all of the grime off the porch, railings, window sill, and brick wall. The broom connects right to your garden hose and has an on/off switch allowing you to control the water flow. It shoots an effective yet gentle stream of water, so if you have a painted porch floor like I do you don’t have to worry about the water pressure lifting off the paint. So here is the final scoop on what I thought about this product! 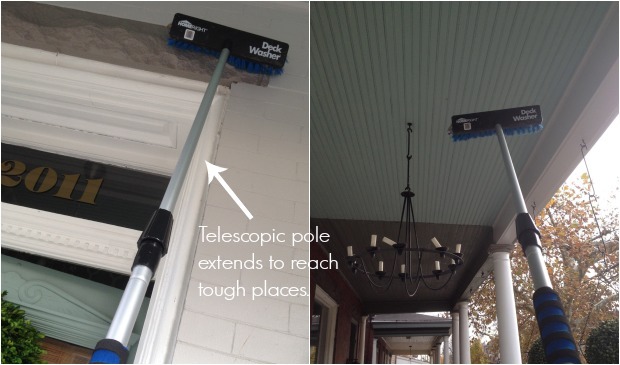 The telescopic pole is fantastic for reaching overhead and is great for cleaning ceilings, walls, siding, etc. The soap dispenser attachment is helpful and allows you to just wash and go. The Deck Washer Broom does a thorough job at cleaning. It’s affordable and reasonably priced for the job it performs. If you are cleaning overhead with the water turned on, you will get very wet :). I didn’t get wet at all, not even my shoes, while cleaning the porch, but I didn’t use any water overhead. The way the water shoots out of the broom works best while holding the broom at a normal downward 45• angle. I used the broom with the water turned on to clean my railings, the lower wall, and the window sill and had to play with the angle I held the broom. My broom head needed to be tightened back onto the broom a few times while cleaning. It wasn’t a big deal to me and didn’t impact the broom’s ability to clean, but I thought it worth mentioning as something to consider. Let’s take a look at how well it cleaned with some final before and after shots! My front porch looks so much better now and is ready to be decorated for Christmas! Woohoo! You can purchase the HomeRight Deck Washer Flow Through Broom on Amazon. Click the previous link (blue writing) to be taken to the site. HomeRight would like one lucky Home Stories A to Z reader to try out a Deck Broom Washer for yourself! To be entered in the giveaway, follow the prompts in the Rafflecopter widget below. (You can choose to do all the methods of entry to increase your chances of winning, or choose to do just one.) Good luck and cheers to clean porches, decks, patios, and sidewalks before the winter sets in! 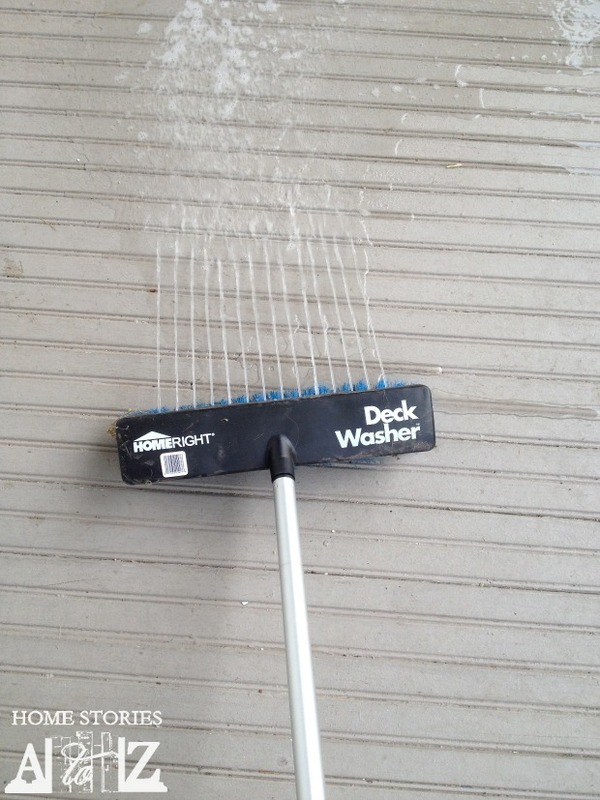 Thanks HomeRight for allowing me to review your Deck Washer! My porch thanks you as well but perhaps not the spiders. The spiders are definitely ticked ;). All opinions on the deck washer are my own. I would use to clean our porch and out building. I would use this for my back deck. O soooo need this to use on my back porch, the ceiling especially! I would use this on my deck and the siding I can’t normally reach. I would use the deck wash on my two very embarrassing dirty side porches. My siding is Filthy so would love something like this to clean it up before the snow begins. Thanks for the great giveaway! Perfect for our wrap around porch! would be great for our patio – thanks for the giveaway! What a great giveaway! I need something just like this for my porch. My porch roof looks a lot like your before photos and I have been needing to get out there to clean it. This will be perfect for the job! I have 10′ porch ceilings also and would love to see how this works! Pretty cool! Didn’t know they had this! And I’d use it for my front and back porch! This would be great for cleaning off our front porch. Our door is still decorated from Halloween. 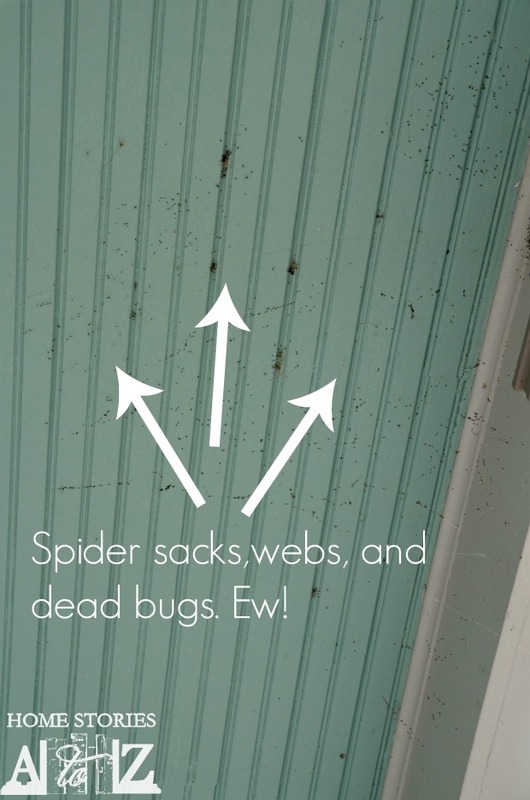 It is time for those bugs and webs to go. This would be a great win for me to use on my porches and deck as it appears light in weight and therefore easy to manage. Thanks! Ooh I could definitely use that on our back deck and stairs! They are in serious need of cleaning! Ewwww, my porch. I was just thinking yesterday how gross it is with the spiders and bugs and dirt and all sorts of yuck. It’s going to be time to hang Christmas decorations before long and I want to get it fixed up! Just what I need for my porch. My siding & windows! I love homeright products! We really need to seal our deck and this would be perfect for cleaning before hand! Also… I have a stone front porch I’ve never been able to clean properly so this would be great for that as well! If I were to win this, I would actually give it to my Mom. She really could use this all over the outside of her house, her decks, etc. She’s getting older and it’s just proving to be too much time/effort to keep up with everything. This would make a great gift for her, especially since the Holiday Season is upon us. I think it would make her feel better, too, that she could still do it herself but it’s be a heck of a lot easier and faster!! Thanks for the chance!! OMG….my deck could totally use this tool! It’s amazing how dirty it gets out there. And despite my efforts to clean it, it just doesn’t look as great as yours now does….this would surely help! Awesome! This would be great to clean my pool deck! This is just what I need. Looks easy! Thanks for the giveaway!! I have a back porch that desperately needs cleaning. My porch, patio, and pergola could use this! My porches would love you for life. 😉 Thanks for this opportunity!! I have a back porch that gets a ton of use. I’d love to have an easier way to get it cleaned up. I have very dirty siding, deck, porch and kids playhouse. This is exactly what I needed for all over the exterior of my house; porches & deck. I NEED this!!! We have two decks!!! Thanks so much for giving one away!!! We have four large decks that are constantly dirty and I’d love to use this on those and all of our windows too!! Thank you so much for the great give away! I’d definitely clean ALL my porches from top to bottom!!! I’m a short girl so the telescopic handle will be awesome! We have a small yellow wood frame house with 27 windows. It collects a lot of spider webs. when we clean the outside wood and the window sills. Wow what a great giveaway! My deck and house could so use a good cleaning from this. Goodbye spiderwebs and dirt, hello clean! The question isn’t where would I use it; it’s where wouldn’t I use it! My entire outside of my house needs a good scrub! What a difference! I would love one of these for our porch too cause bugs aren’t the only creatures envying your porch right now! All of the above – especially my porches. My back patio needs some serious help -this would be great. I’ve got a whole lotta porch to clean with one that wraps around the whole house! Thanks for the chance to win…. Who needs store bought Halloween decorations when we had all the creepy spiders we needed naturally! I would totally use this near the back door, garage, etc. I desperately need this for my front porch. I would love to try this on the siding in the front and back of our home and on the garage door. Those areas are usually shaded, so they have a lot of gunk built up on them! I could sure use this right now on my porch and back deck area…thank you for giving us the heads up about this product….I would love to win one! I had no idea anything like that existed! I could totally use something like this! Great giveaway! I would use it on my patio, sidewalk, garage, house…oh my goodness, everything!! I have a great front porch, but at this time of year I need to clean away mildew, dirt and paw prints to get it looking good for the holidays!